Reading and share top 12 famous quotes and sayings about Mathematics And Science by famous authors and people. 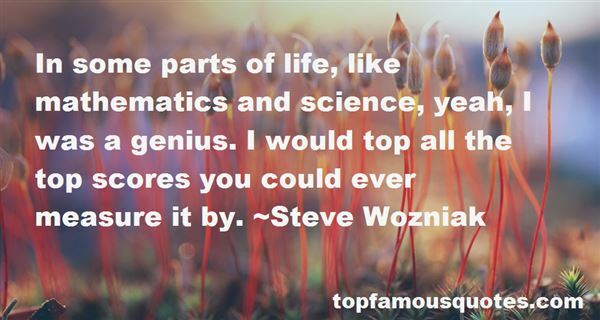 Browse top 12 famous quotes and sayings about Mathematics And Science by most favorite authors. 1. "In my family, as in most middle-class Indian families I knew when I was growing up, science and mathematics were held in awe." 2. "At schools, the children who are too stupid or lazy to learn languages, mathematics and elementary science can be set to doing the things that children used to do in their spare time. Let them, for example, make mud pies and call it modelling. But all the time there must be no faintest hint that they are inferior to the children who are at work. Whatever nonsense they are engaged in must have—I believe the English already use the phrase—"parity of esteem." An even more drastic scheme is not impossible. Children who are fit to proceed to a higher class may be artificially kept back, because the others would get a trauma—Beelzebub, what a useful word!—by being left behind. The bright pupil thus remains democratically fettered to his own age group throughout his school career, and a boy who would be capable of tackling Aeschylus or Dante sits listening to his coeval's attempts to spell out 'A Cat Sat On A Mat'." 3. "I appreciate and enjoy mathematics and science and all that side of things. I definitely have that side of me even though I'm not by any means an expert, but I love reading about physics and math and that kind of stuff. I wish I knew more than I did. I mean, I read books written for laymen, not textbooks or anything." 4. 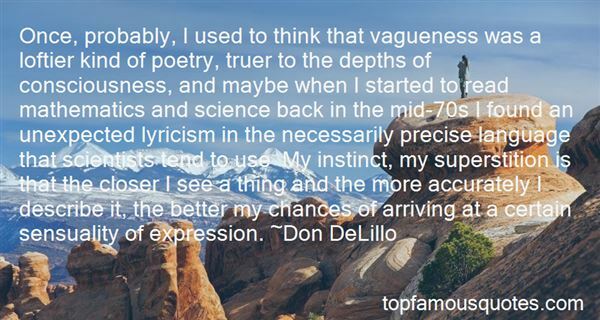 "Once, probably, I used to think that vagueness was a loftier kind of poetry, truer to the depths of consciousness, and maybe when I started to read mathematics and science back in the mid-70s I found an unexpected lyricism in the necessarily precise language that scientists tend to use My instinct, my superstition is that the closer I see a thing and the more accurately I describe it, the better my chances of arriving at a certain sensuality of expression." 5. "These estimates may well be enhanced by one from F. Klein (1849-1925), the leading German mathematician of the last quarter of the nineteenth century. 'Mathematics in general is fundamentally the science of self-evident things.' ... If mathematics is indeed the science of self-evident things, mathematicians are a phenomenally stupid lot to waste the tons of good paper they do in proving the fact. Mathematics is abstract and it is hard, and any assertion that it is simple is true only in a severely technical sense—that of the modern postulational method which, as a matter of fact, was exploited by Euclid. The assumptions from which mathematics starts are simple; the rest is not." 6. "The science of government it is my duty to study, more than all other sciences - the arts of legislation and administration and negotiation ought to take the place of, indeed exclude, in a manner, all other arts. I must study politics and war, that our sons may have liberty to study mathematics and philosophy. Our sons ought to study mathematics and philosophy, geography, natural history and naval architecture, navigation, commerce and agriculture in order to give their children a right to study painting, poetry, music, architecture, statuary, tapestry and porcelain." 7. "John Dalton was a very singular Man: He has none of the manners or ways of the world. A tolerable mathematician He gained his livelihood I believe by teaching the mathematics to young people. He pursued science always with mathematical views. He seemed little attentive to the labours of men except when they countenanced or confirmed his own ideas... He was a very disinterested man, seemed to have no ambition beyond that of being thought a good Philosopher. He was a very coarse Experimenter & almost always found the results he required.—Memory & observation were subordinate qualities in his mind. He followed with ardour analogies & inductions & however his claims to originality may admit of question I have no doubt that he was one of the most original philosophers of his time & one of the most ingenious." 8. "The way the school was structured, if you were doing sciences, they didn't consider that you would ever do art, so the classes conflicted. So I did all the science subjects, mathematics 1 and 2, and physics and chemistry, but it conflicted with the art class. I had to do art by myself, basically, after school because I couldn't get it coordinated." 9. "The law of gravity and gravity itself did not exist before Isaac Newton." ...and what that means is that that law of gravity exists nowhere except in people's heads! It 's a ghost! "Mind has no matter or energy but they can't escape its predominance over everything they do. Logic exists in the mind. numbers exist only in the mind. I don't get upset when scientists say that ghosts exist in the mind. it's that only that gets me. science is only in your mind too, it's just that that doesn't make it bad. or ghosts either. "Laws of nature are human inventions, like ghosts. Law of logic, of mathematics are also human inventions, like ghosts. "...we see what we see because these ghosts show it to us, ghosts of Moses and Christ and the Buddha, and Plato, and Descartes, and Rousseau and Jefferson and Lincoln, on and on and on. Isaac Newton is a very good ghost. One of the best. Your common sense is nothing more than the voices of thousands and thousands of these ghosts from the past." 10. "In some parts of life, like mathematics and science, yeah, I was a genius. I would top all the top scores you could ever measure it by." 11. "The science of mathematics applies to the clouds; the radiance of starlight nourishes the rose; no thinker will dare say that the scent of hawthorn is valueless to the constellations... The cheese-mite has its worth; the smallest is large and the largest is small... Light does not carry the scents of earth into the upper air without knowing what it is doing with them; darkness confers the essence of the stars upon the sleeping flowers... Where the telescope ends the microscope begins, and which has the wider vision? You may choose. A patch of mould is a galaxy of blossom; a nebula is an antheap of stars. There is the same affinity, if still more inconceivable, between the things of the mind and material things." 12. "We in science are spoiled by the success of mathematics. Mathematics is the study of problems so simple that they have good solutions." We seek rest in a struggle against some obstacles. And when we have overcome these, rest proves unbearable because of the boredom it produces..."